Pizza Hut, forever a reliable peddler of cheap, stuffed crusts, is expanding its beer delivery pilot program. The new scheme won't involve beer-infused pies, but deliveries of six-packs from nearly 100 outposts in Arizona and California, the company announced on Tuesday. Pizza Hut's ploy is clear: it wants you to couple your pizza dinner with an ice-cold round of suds. 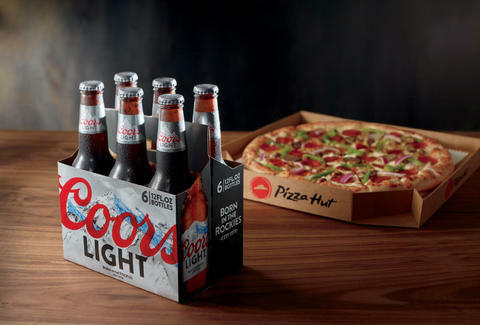 With the program, the company will shave off delivery charges for Arizona residents with the purchase of Coors Light, Blue Moon, or Miller High Life six packs through Pizza Hut's website or app. California residents won't have the delivery charge waived for purchasing beers. The beer will be delivered in a "custom cooler," per a press release, as if you needed a branded vessel to carry your cheap lager. The pilot program started in December when Pizza Hut announced plans to deliver beer from one restaurant in Phoenix. Now, the company is expanding across the state into Tucson and Glendale, Arizona. Markets in California include Los Angeles, Bakersfield, Riverside, Sacramento, Santa Barbara, and Santa Clara, with Anaheim, Huntington Beach, and Redding to come later this month. Zipporah Allen, Pizza Hut's chief marketing officer, played the roll of your everyday, laid back corporate executive in a statement, saying: "Nothing complements an oven-hot pizza like an ice-cold beer." "In addition to our extensive delivery network, many Pizza Hut restaurants are already licensed to serve and distribute beer, without third party services, additional fees, or extended wait times," she said. "Expanding the pilot program is a natural way for Pizza Hut to get our customers the perfect pizza and beer combo they're craving, delivered right to their doors." There's no word on a nationwide rollout of Pizza Hut beer delivery, although it'll probably take off more quickly than Domino's efforts to deliver pizza in the middle of Times Square, or via drone.